Using solar power to heat your pool and extend the swimming season! Choose our cost friendly pool heating alternative. You’ll qualify for Arizona tax credits and save serious money on heating your pool. This is an investment that will keep you in the pool even during the months you normally do not swim. Even better, it’ll not only pay for itself over time, but continue saving you money long after. Call 602-547-1598 today to learn more! 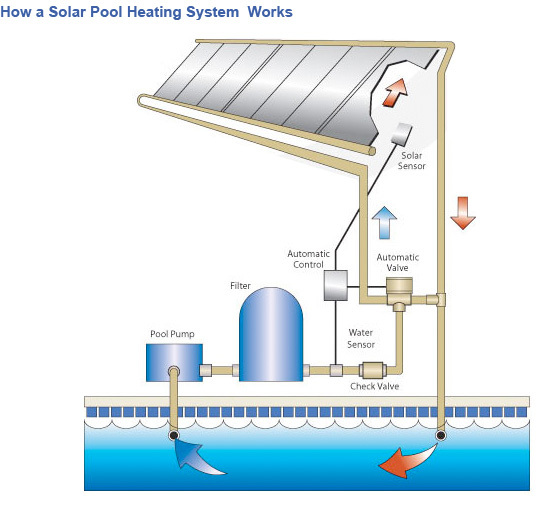 Your original pool pump transfers water form your pool into the solar hot water collectors. These are usually thin black collectors fastened to the roof of a home or business. The solar panels use the sun’s direct heat to bring the pool water up to a nice comfortable temperature. There’s no better place than Arizona to use a solar pool heater! Learn more about your Solar Pool Heater here! What Type Of Solar Collector Works Best? There are several types of solar water collectors and choosing the right one depends on several factors. Call Arizona Accurate today at 602-547-1598. One of our solar experts can perform an in-depth analysis to help you determine exactly what type of solar collectors will meet your demands and expectations. Does your pool get just a little too warm during the hot Phoenix-area summers? You can actually use our solar pool heating system to cool the water down. This is done by running the system at night, allowing the water collector to expose the pool water to cooler, nighttime air. Why Choose Arizona Accurate For Your Solar Pool Heating? Hiring us means dealing with Arizona’s premiere solar energy provider. You can count on our highly qualified technicians to install you solar pool heater. We have decades of experience serving Glendale, Phoenix and the surrounding area. Harnessing the power of the sun is our passion and we are happy to help others break free from dirty, expensive sources of power. Take advantage of natural solar power. You’ll do the right thing for your paycheck and the environment. Trust Arizona Accurate to install your solar pool heater. We’ll get the job done right!